Kale Decker and Kevin Noldy led the Elk Lake boys swim team to a narrow victory over Wallenpaupack, 83-80. Decker won the 100 Fly and the 200 intermediate and was part of two winning relay teams. Noldy captured the 100 freestyle and the 100 Back stroke and also was part of two winning relays. Decker and Noldy were joined by Noah Staff and Mario Mollo to capture the 200 Freestyle Relay. Decker teamed with Zach Grovesnor, Isiac Brewer, and Zachary Shields to win the 400 Freestyle Relay as well. Noldy, Decker and Staff teamed with Grovesnor to take the 200 Medley Relay. Elk Lake also picked up points with Mollo’s second-place finish in the 50-meter freestyle. The Lady Warriors fell to Wallenpaupack, 101-68. 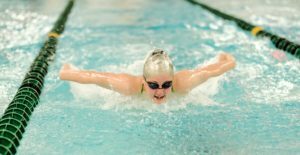 Elk Lake did get individual wins from several swimmers led by Reese Warriner who captured the 200 Intermediate and finished second in the 100 Freestyle. Georgia Smith earned first place in the 100 Backstroke and Megan Bosscher won the 500 Free. Elizabeth Lyden had two second-place finishes being the runner-up in the 50 Freestyle and the 100 Breast stroke. Several local athletes competed in The Run at the Rec held at the indoor facility of the Clarks Summit University. Montrose’s Collin Chidester led the way capturing the title in the 400 meter in 55:23 also taking the 200 meter in 25:31. In the 3000 meter Montrose’s Liam Mead finished second with a time of 9:28.31 and was followed by teammates Max Brewer (10:14.25) who finished fourth and Nick Coy who came in sixth. Mead finished fourth in the 800 meter and was followed by teammate Colin Spellman in sixth. Chidester also earned a second place in the 55 -meter hurdles coming in at 8.27. Mountain View’s followed in sixth place. Spellman was also fifth in 1600 meter and Montrose’s Tracy Kerr had a third-place finish in the 200 meter and finished in fourth place in the 55-meter. On the girls side Montrose’s Hannah Perkins garnered third place in the 3000 meter and teammate McKenzie White placed sixth in the 200. In a throwing event Forest City’s Sarah Korty threw the Shot Put 36-4.5 to earn second place. Be the first to comment on "Decker, Noldy lead EL swimmers to win"